Algae. The stuff that makes the sides of your pool green, or can make it particularly gross to go swimming in a lake in the summer. These tiny plants are hugely beneficial, as they help clear pollution out of the water and make oxygen in the process. But when they pull too many nutrients out of the water, they can cause algae blooms, essentially too much algae in the water, which kill off other forms of aquatic life causing "dead zones." 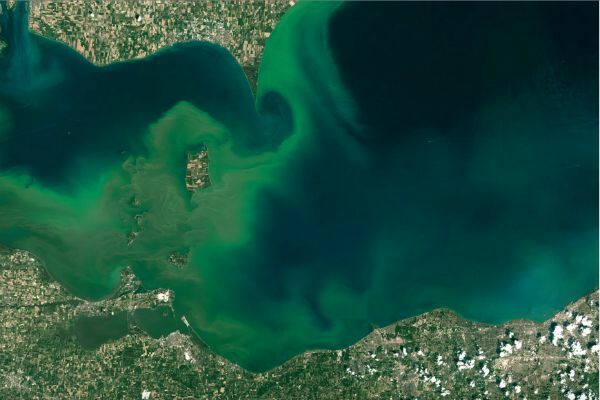 Algae blooms are a growing problem, most notably the algae blooms in Lake Erie, and "Red Tides" found all over the world. A new company out of Meridian, Mississippi, Bloom, is finding a new way to help the planet by making yoga mats, shoes, luggage, and packaging from algae. Bloom uses a mobile harvesting system to clean algae out of waste streams in the U.S. and other parts of the world. This is then turned into an algae-rich slurry, which when dried, can then be turned into a polymer, or plastic. Algae is able to be turned into a polymer, as the proteins that make up algae are the same as those in polymers, and in high enough quantities. Once the algae has been turned into a polymer, which comes out in tiny pellets, a foaming agent is added, which acts like the air when you make home-made whipped cream, and makes the polymer light and fluffy. This produces a foam, made up of up to 60 percent algae, which can be turned into all different kinds of products. All in all, this means less synthetic polymer in your yoga mat! Bloom is using this algae-based foam to make all sorts of products: yoga mats, packaging, luggage, and even shoes. The foam is available in eight different colors, giving you lots of options to choose from. Unfortunately, Bloom hasn't gone into production quite yet, but their products should be available next year. Think on that next time you go swimming and see that nasty pond scum!